Custom mugs are made to last. Your designs won't wash off, fade, or peel. Enjoy the unsurpassed quality of these unique photo mugs. This also makes a fun-filled gift when personalized with a humorous cartoon or memorable photo. 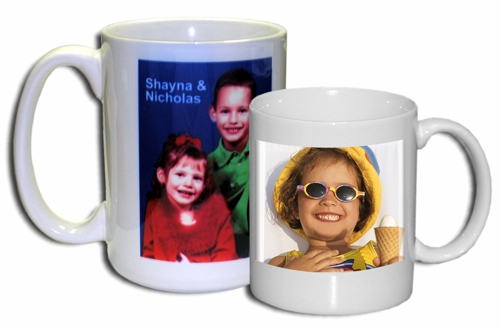 Personalized photo mugs are sensational as wedding favors imprinted with the photo of the bride and groom, or as inspirational gifts with imprinted photos of saints or religious icons.